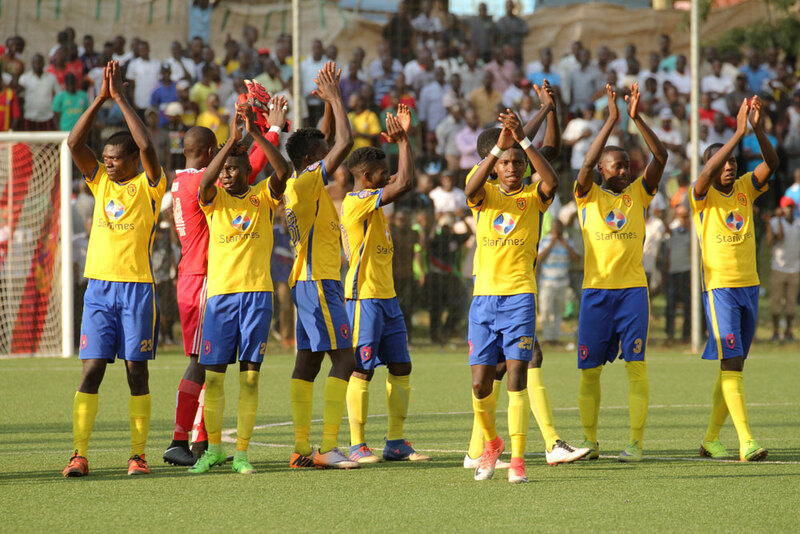 LUGOGO – KCCA FC produced a dominant performance as they defeated Mtibwa Sugar 3-0 in the CAF Confederations Cup first round 1st leg tie at the StarTimes in Lugogo. Three second half goals by Allan Kyambadde, Patrick Kaddu and Allan Okello did the damage for Mike Mutebi’s side who could have easily scored seven or more on the day. KCCA dominated the early exchanges applying pressure onto the Mtibwa goal. The first chance of the game fell to Allan Okello who unleashed a shot from outside the area but Mtibwa goalkeeper Shaaban Shaaban was on hand to collect comfertably. Five minutes later, Jafari Kibaya was at the receiving end of Mtibwa’s first chance, heading weakly at Charles Lukwago in the KCCA goal. On 11 minutes, Allan Kyambadde shot straight at Shaaban after a neat one two with Okello. Moments later, the former SC Villa midfielder was at it again, blazing over after Shaaban saved Kaddu’s looping effort. With 19 minutes played, Issa Issa headed over following a Salum Kihimbwa corner and at the other end, Kaddu failed to connect with a Kizza cross while one on one with Shaaban. The first yellow card of the game was shown to KCCA Captain Timothy Awanyi for a foul on Ismail Mhesa with the Mtibwa winger trying to ignite a counter-attack. At the half hour mark, Ally Yusuph was shown yellow for a sliding challenge on Lawrence Bukenya as the visitors tried to see out the remaining minutes of the first half. Two minutes later, Kyambadde was guilty of missing another chance as he headed wide a Kizza cross, while unmarked in the area. On 37minutes, it was Kizza’s turn to waste an opportunity as the left-back shot tamely at Shaaban after he was played in by Nunda. At the other end, Kibaya saw an effort kiss the over-side of the cross bar while one on one with Lukwago, in the visitor’s best chance of the half. Despite more relentless pressure, KCCA could not break Mtibwa down in the first half and both sides were sent into the break still locked at 0-0. The second half started like the first with KCCA applying the early pressure and eventually got their reward on 49 minutes when Kyambadde’s fierce drive was fumbled by Shaaban before it crossed the line to put the Kasasiros ahead, 1-0. Despite the goal, KCCA didnot stop attacking as Nunda headed wide of the target on 55 minutes after he was played in by Filbert Obenchan. Two minutes later, Kaddu also headed straight at Shaaban following Obenchan’s wonderful run down the right. The first substitution of the game saw Muzamir Mutyaba replace Gift Ali as KCCA looked to apply more pressure upfront. KCCA always looked like they would add onto their tally but it couldn’t happen for Mike Mutebi’s side and on 69 minutes, Kaddu shot wide after he was played in by Okello. Nunda who was brilliant all day saw his effort expertly tipped over by Shaaban on 73 minutes after the lanky-midfielder was played in by Kyambadde’s cross from the right. Moments later, Kizza unleashed a fierce drive that was fisted away by Shaaban. The second goal would eventually come with 15 minutes to play, Kaddu heading in Kyambadde’s cross and calm the many nerves at Lugogo. KCCA’s last substitution saw Suleiman Mutyaba replace Nunda with 10 minutes to play. Mtibwa tried to mount a late charge to at least pull a goal back but they could not breach the KCCA back-line. With three minutes on the clock, Okello made it 3-0 off a curling effort from just outside the box after he was teed up by substaitute Suleiman Mutyaba. After today’s victory, KCCA FC will go into the return leg next week confident progressing to the Group stages of the competition. Charles Lukwago (gk), Filbert Obenchan, Timothy Awanyi, Hassan Musana, Lawrance Bukenya, Mustapha Kizza, Gift Ali, Allan Okello, Allan Kyambadde, Jackson Nunda, Patrick Kaddu.